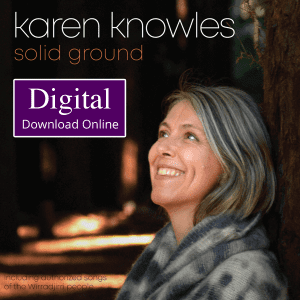 Karen Knowles has recently completed her 7th studio album Solid Ground which features songs by Karen Knowles accompanied by musicians Michael Kokinos (guitars, harp) and Caerwen Martin (cello). Authorised sacred songs from the Wirradjirri indigenous people are also featured including spoken word introductions by Wirradjirri elder Min Mia. The album will be officially launched in March 2020 to coincide with International Women’s Day so the gift of Min Mia’s songs can be celebrated with all Australian women. This release has been brewing for some years and is built upon Karen’s work with Wiilpa (wiilpa.org) and her relationships with indigenous people throughout Australia going back to 1995. Some songs like Listen and Hit the drum were written in 1999 but seem most appropriate and relevant in today’s time. Others like The Birds, And I knew, Solid Ground, and The Shipwreck song (inspired by Karen’s experience at a Shipwreck site on the New South Wales coast) were all written in 2018. The melody for Belong was written by Karen in Tuscany in 2016 with lyrics written in 2018 at the time of the recording of the Solid Ground album. Karen will be launching the new Solid Ground album in March and will be touring with this album in 2019/2020. If you would like to stay in touch about future performances please send us a note and we will add you to our mailing list. If you would like to book Karen to perform at your venue or event you can contact us here. We look forward to your feedback on the new album and to seeing you at one of the future performances.